Place chicken, onion, carrot and celery into a small stock pot; add water to just cover chicken. Season with salt and whole black peppercorns. Bring to a boil. Skim off any foamy gunk, then lower heat and simmer until chicken is cooked, about 20 minutes. Remove chicken from pot and continue to simmer broth. When chicken is cool enough to handle, remove skin and bones and put back into the pot. Tear or cut chicken into bite-sized pieces and reserve. Continue to simmer broth while you prepare remaining ingredients, then strain broth and reserve. 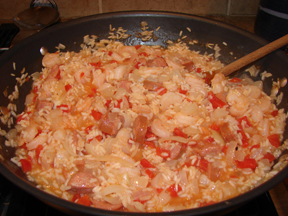 Cook kielbasa in a large skillet until lightly browned on cut edges; remove from heat and reserve. Combine vegetable oil and flour in a Dutch oven or large heavy skillet and stir over medium-high heat until the mixture (roux) turns dark tan to medium brown. Be careful not to burn or scorch it. Add onion, bell pepper, celery and garlic to brown roux and stir until vegetables begin to soften, about 5 minutes. Stir in 3 cups reserved chicken broth and bring to a simmer. Stir in reserved cooked chicken and kielbasa and simmer for 10 minutes to combine flavors. Add more broth if desired. Just before serving, stir in shrimp and cook just until shrimp are pink and curled. 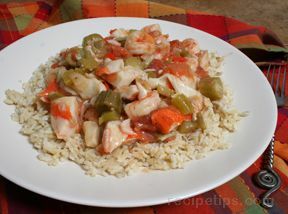 Serve gumbo over white rice. Yield: 8 servings. *You could use rotisserie chicken and canned broth to save time.